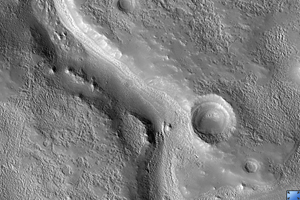 HiRISE image ( PSP_003312_2145 ) reveals valleys that cross the ejecta from the large impact crater Cerulli to the south. The valleys appear to have been cut by flowing water and then buried by later deposits of unknown origin, possibly carried in by the wind. While it is clear that the valleys are younger than the ejecta and older than at least some of the mantling materials, the exact time they were formed is uncertain. For example, it is possible that the valleys were carved immediately after Cerulli crater formed, as has been inferred for some other valleys around craters imaged elsewhere on Mars by HiRISE. Alternatively, the valleys may have formed some time after the crater formed, perhaps as a result of water released from an earlier mantling deposit. A second image is planned for this area and will yield three-dimensional information from stereo that may help to resolve the timing and source of water responsible for carving the valleys.